The ADINA solver can be used with Simcenter 3D and Femap pre/post, so NX Nastran customers can seamlessly migrate from SOL 601/701 to ADINA without changing their workflow. Automatic analysis switch to change the analysis type at any solution time, including switching to frequency analysis. Frequency analysis at any solution time in linear and nonlinear analysis, including analyses with contact. User-defined elements, materials, loads, and frictional contact conditions. Ability to model bolt tightening sequences (bolt tables). Cyclic symmetry and periodic symmetry boundary conditions. Buckling, post-buckling and crush/crash response of solids and structures, including geometric imperfections. The ADINA sparse solver has recently been greatly improved allowing customers to increase their productivity, while maintaining a high level of accuracy, for a wide range of analysis problems. Please see Customer Experiences with the New ADINA Sparse Solver. Explicit dynamic analysis and mode superposition dynamic analysis. Automatic switching from implicit dynamic analysis to explicit dynamic analysis. The Bathe time integration scheme for implicit dynamic analysis. Special-purpose advanced nonlinear elements for mechanical joints, sliders, bushings, bearings, dashpots, robotic arms, etc. Advanced nonlinear beam elements that account for the Wagner effect. 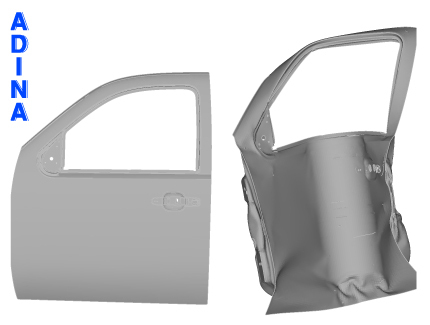 3D-shell elements for problems with large strain out-of-plane bending such as crash/crush analysis, metal forming, and deformation of thin rubber components. Potential-based fluid elements for static, dynamic and frequency analysis. A rich library of material models for soils and rocks, cast iron, plastics, rubbers, foams, fabrics, wood, ceramics, porous-media, and concrete. ADINA R & D offers special pricing for you as a user of SOL 601/701. Please contact ADINA R & D for a full list of capabilities and special pricing to obtain ADINA. A complete list of ADINA Structures capabilities not available in SOL 601/701 is given below. Please refer to the Theory and Modeling Guide – Solids & Structures for details of each item.